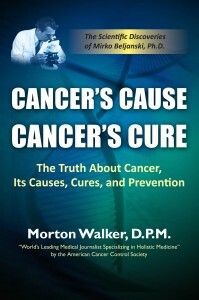 Author: Dr. Morton Walker, D.P.M., is the author of 2000 clinical articles and 92 published books. Dr. Walker is the recipient of 23 medical journalism awards and was named, “The World’s Leading Medical Journalist Specializing in Holistic Medicine” by the American Cancer Control Society. (Note: Podiatric medicine is the study of human movement, focusing on the foot and ankle. A doctor of podiatric medicine (DPM) is to the foot what a dentist is to the mouth or an ophthalmologist to the eye). Why Write this Book? When cancer took my wife, my mother, my sister, and my fiancee who had pledged to spend her last years with me, I knew I had to step up …let the world knows about it. Fiancee With Pancreatic Cancer: We planned to be married within the early months of 2005, instead, during late fall and early winter of 2004, I frequented the reception areas and consultations of Massachusetts General Hospital … because my fiancee had been admitted to this hospital with pancreatic cancer. Prognosis: Such cancer (pancreatic cancer) is an illness with a devastating prognosis … less than 7 percent of cases are detected early. The rest are spotted when pain or other symptoms appear. Some 37,680 new cases of pancreatic cancer occurred in 2008, with a mere 2 percent experiencing a five-year survival rate. 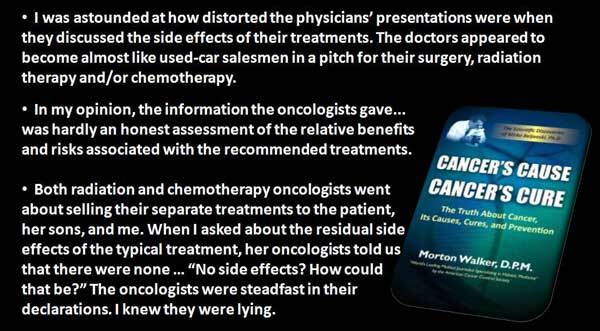 Oncologists and Radiotherapists Push: I was astounded at how distorted the physicians’ presentations were when they discussed the side effects of their treatments. The doctors appeared to become almost like used-car salesmen in a pitch for their surgery, radiation therapy and/or chemotherapy. I know something about medical practices and oncology from my work as a medical researcher and as a former practicing podiatrist. In my opinion, the information the oncologists gave my fiancee was hardly an honest assessment of the relative benefits and risks associated with the recommended treatments. 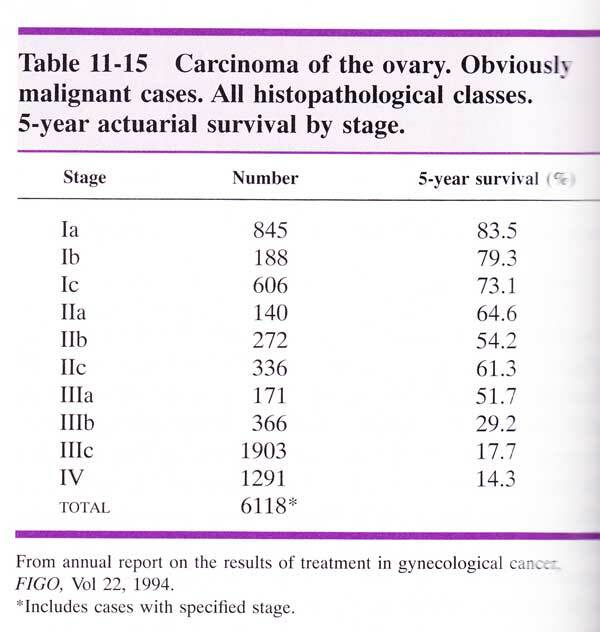 My fiancee, her two educated, middle-age sons and I consulted twice with a group of oncological specialists. The decision was made that this 62-yera-old woman, diagnosed with an aggressive pancreatic cancer, required immediate surgery employing the Whipple’s operation triad. The Whipple’s is a very extensive operative procedure that involves the excision of at least three internal organs, including a majority of the victim’s pancreas. 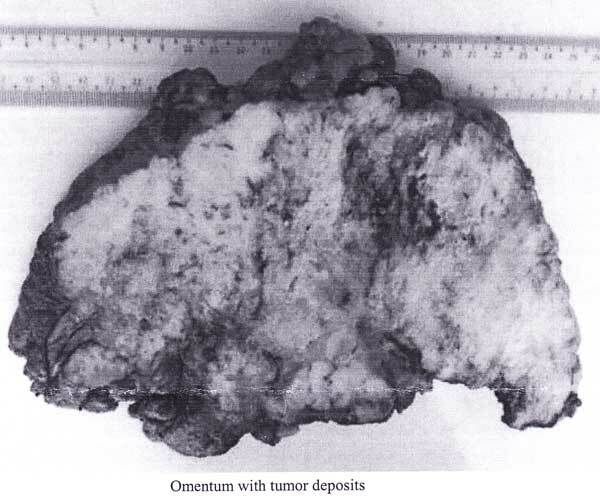 Preoperative radiation was recommended for her, and following operative recovery, postoperative chemotherapy was also mandatory. 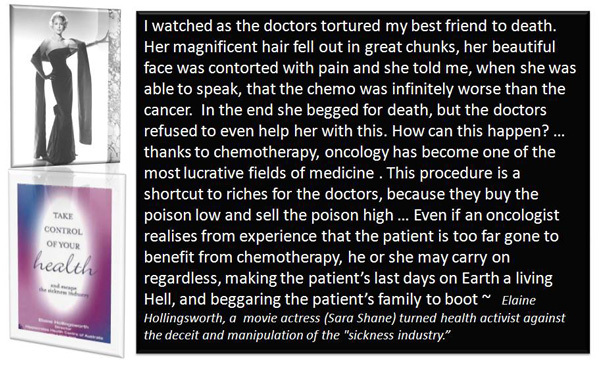 Both radiation and chemotherapy oncologists went about selling their separate treatments to the patient, her sons, and me. 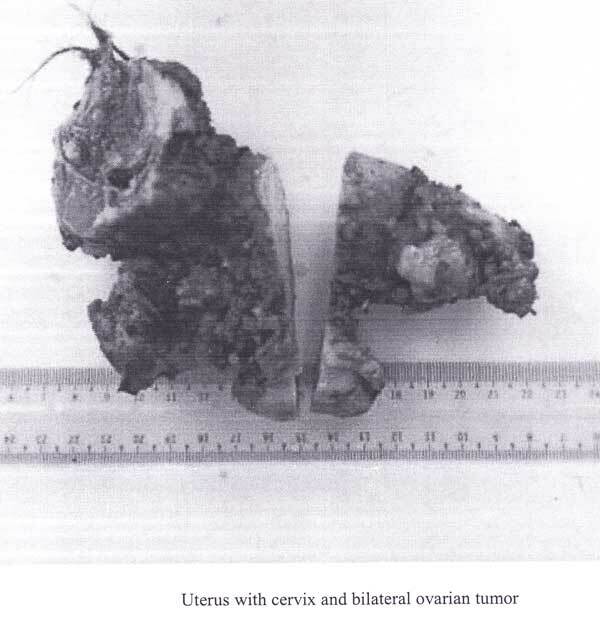 When I asked about the residual side effects of the typical treatment, her oncologists told us that there were none. My fiancee, her sons and I were astounded. “No side effects? 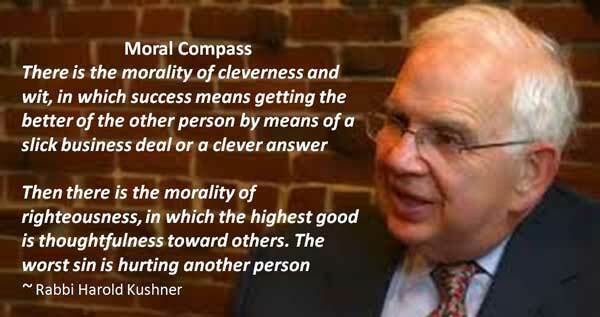 How could that be?” The oncologists were steadfast in their declarations. I knew they were lying. I observed literally hundreds of bald-headed women waiting in the radiotherapy and chemotherapy hospital areas for commencement of their next treatments. 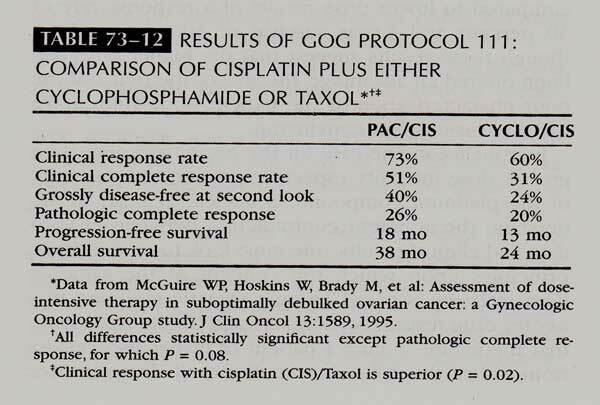 I thought, with no small amount of disgust, “Isn’t the loss of hair with resultant baldheadedness a side effect of one or both of these cancer therapies?” All of us know that it is. 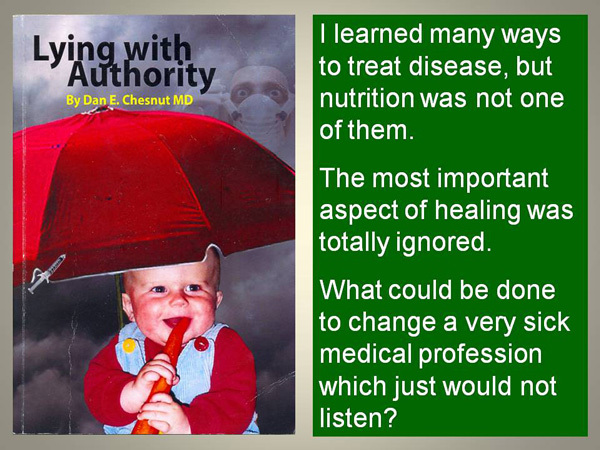 I was opposed to the radiation therapy, but that’s what this patient and her two sons elected for her to do. When I finally encouraged my fiancee to take Dr. Beljanski’s botanicals … Her two sons, a stock broker and a computer programmer, would have none of my recommendations. Beljanski’s herbals ended up being flushed down the hospital room’s toilet. They considered holistic-type therapies outright quackery. Condemned by these young men, I was literally ordered to leave the hospital scene. They said, “Get out of my mother’s life!” She died within two months of her sons sending me away.